In my last post a Hudswell Clarke loco was mentioned as possibly being in steam on the next open Day. This was No.431 of 1895, which arrived at Chasewater shortly before ‘Asbestos’. Sadly, this did not happen, and as far as I am aware, this loco still has not steamed at Chasewater Railway, over 40 years later! ‘On Saturday 2nd December, 1967, a long-awaited member of our loco stud arrived – by road – a Hudswell Clarke 0-6-0ST, used until December, 1966, in the Ironstone Quarries at Desborough. This locomotive was steamed by Mr. Civil and Mr. Luker (our expert loco-fitters) before purchase, and ran for some little while before they declared it a good purchase. It was built by Hudswell Clarke & Co., Leeds in 1895, works number 431 and spent most of its life in the hands of the Sheepbridge Coal & Iron Company in whose fleet she became No.15. It was allocated the name ‘Sheepbridge No.25’, but this was never carried and with the removal of its official number and works plates ran its last years without any identification at all. ‘The engine was first suggested as a suitable candidate for preservation some two years ago when it was one of several locomotives at work at Desborough Warren Quarry near Kettering. One by one its companions were withdrawn leaving No.15 as the only workable source of motive power. After closure of the quarry it assisted with the lifting of the track, until the early part of 1967 when it too was withdrawn and stored in the engine shed at Desborough in company with an Avonside 0-6-0T. At the moment, ‘Asbestos ‘ is in the Heritage Centre awaiting a major overhaul, as, indeed, is 431. As this Hudswell Clarke loco is back in the museum half of the heritage centre here is a little more information. The oldest six-coupled loco from this Leeds builder in existence. 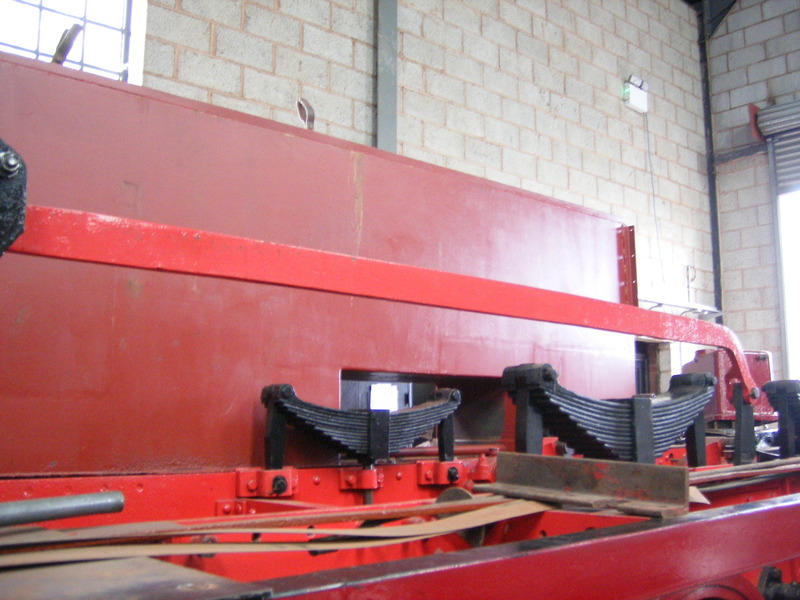 Delivered new to Sheepbridge Iron Works near Chesterfield as their No.15. The loco worked at Sheepbridge and also at the Company owned collieries at Glapwith and Langwith prior to a move to Desborough Quarry, Northamptonshire in March 1951. The loco came to Chasewater in 1967 after purchase for £195. Cosmetic restoration only is likely in the near future as the loco is in an advanced state of corrosion. The second new arrival at Chasewater Railway was a six-coupled side tank built by Hudswell Clarke & Co. of Leeds, works no.1822 of 1949 and is known as S100. It is an interesting locomotive, the design dating back to 1909 when Hudswell Clarke supplied a six-coupled side tank with 15” x 22” outside cylinders to the Burry Port and Gwendraeth Valley Railway. This loco was the BPGVR’s no. 8 and was named ‘Pioneer’. Over the next ten years Hudswells provided BPGVR with another eight similar locos, though they differed in certain details of design. S100 was one of an order placed by the National Coal Board following Nationalisation, being ex-works on 29-4-1949, works no.1822. She was delivered to Whitwood Colliery near Castleford, as ‘Whitwood No.1’ and was later joined by two sister locos, replacing some ageing Robert Stephenson 0-6-0STs sold out of service by the North Eastern Railway in the early 1900s. For a period in 1955, she was sent on loan to the adjacent Walter Haigh Colliery, as she was again in July 1956, this time not returning to Whitwood, being observed at Allerton Bywater Colliery in 1957. Later in the year she was at Prince of Wales Colliery, Pontefract. In 1958 she was back at Allerton Bywater being completely overhauled at the adjacent workshops in 1959. Following this she was sent in 1960 to Peckfield Colliery, Micklefield, where she was to spend the rest of her working life under Coal Board ownership. In 1965 she was sent to Hunslet’s of Leeds for the fitting of a new steel firebox, mechanical stoker, new blast pipe arrangement and thorough overhaul. Returning to Peckfield she was used intensively, being the only serviceable loco for much of the time. By December 1968 she was at Allerton Bywater central workshops, following re-tubing at Peckfield, for a complete overhaul, being out-shopped the following October in red livery and carrying the number S-100, S standing for steam locomotive. S100 was sent back to Peckfield and worked alongside an Austerity and latterly ‘Primrose No.2’, a Hunslet 16” saddle tank, now preserved on the Yorkshire Dales Railway at Embsay. Barry Bull bought a share in the loco and already work on the overhaul has started, with removal of the cab roof and se-scaling of the firebox, followed by a start on removing the boiler tubes. S100 was moved to Chasewater on the 18th February by Messrs. Brackmills of Northampton, following several weekend visits to Embsay to prepare the loco for movement. Despite press reports to the contrary the loco was unloaded fairly easily, the low-loader crew only being at Chasewater for 1½ hours, something of a record. Thanks are due to Keith Rose, Charles Adams, Steve Fenwick and Martin Cleaver for their hospitality whilst the loco was awaiting movement and also to the lorry crew for their enthusiasm. It is interesting to note that the left hand tank on S100 is off Whitwood No.4, being bought in 1976 to replace the original tank which was somewhat rotten. Work on S100 is expected to take three to five years and will include firebox repairs, a complete re-tubing (tubes have already been acquired), overhaul of motion, wheel turning, re-plating of bunker and fitting of vacuum brakes. By the time that S100 sees service at Chasewater there should hopefully be a longer stretch of line for it to run upon and it should be ideally suited to work here and give many years of trouble free service. Further details will appear once the loco is at Chasewater. From the Chasewater News 24, July 1978 The legal loan agreement has been completed and the engine should arrive during August. From the ‘Gricers’ Day’ report, 8th October, 1978. Through the kindness of the Directors of Albright & Wilson Ltd., Peckett 0-4-0ST works no. 917 of 1902 arrived on permanent loan together with coal, 27 spare boiler tubes and various tools. From the Chasewater News 25, November 1978. A powerful locomotive of a design originated by Hawthorn Leslie. Ex the builders’ Forth Bank works, Newcastle-upon-Tyne on August 7th, 1951, 7684 was one of a batch supplied to the British Electricity Authority initially being delivered to Meaford Power Station near Stone, Staffordshire. By October, 1951, just two months later, 7684 was transferred to Nechells Power Station, Birmingham to serve the old Power Station ‘A’ which had opened in 1916 and ‘B’ station then still under construction on land previously occupied by the Birmingham, Tame and Rea Drainage Board (the body responsible for control of the city’s sewage). 7684 became number 4 in the steam locomotive fleet at the Power Stations, sharing duties with a couple of sister locomotives and a pair of much smaller Peckett 0-4-0 saddle tanks. Rakes of loaded coal wagons were collected from the British Railways exchange sidings on the former Midland Railway Birmingham to Derby line, and worked up a line approximately ¾ mile in length into the Power Station to supply the boilers, empties being returned in the opposite direction. Regular steam working ceased in 1972 and the locomotives tendered for disposal with the exception of the Peckett No.1 which moved on the Northampton Power Station. Peckett No.2 was scrapped but the big RSH side tanks 3 and 4 were purchased privately, going to Shackerstone, Leicestershire. No.4 was preserved at the Battlefield Line Railway at Shackerstone, arriving there on 11 June 1973. It was restored to working order by its owner in 1995, and then moved to the Foxfield Railway on 8 July 1996, where its livery was completed in the lined green form originally carried when new at Meaford Power Station. “No 2” has been a regular and powerful performer on Foxfield passenger trains ever since. The owner of 7684 recently decided to sell the locomotive which has now been purchased by Chasewater members and arrived at Chasewater on 11th December 2010. In the yard at Chasewater. Just a few photos showing good progress on the loco. A very sad picture of Barlay 0-4-0ST 2343/1953 also known as British Gypsum No. 4. Found another pic, no better but the engine’s still in one piece! This Barclay engine, similar to ‘Colin McAndrew’, was purchased with the intention of being used, in the first instance, to complete the restoring to working condition of Colin McAndrew by donating its boiler, having a 10 year certificate. Perhaps, in the fullness of time, British Gypsum No. 4 will be restored in its own right. 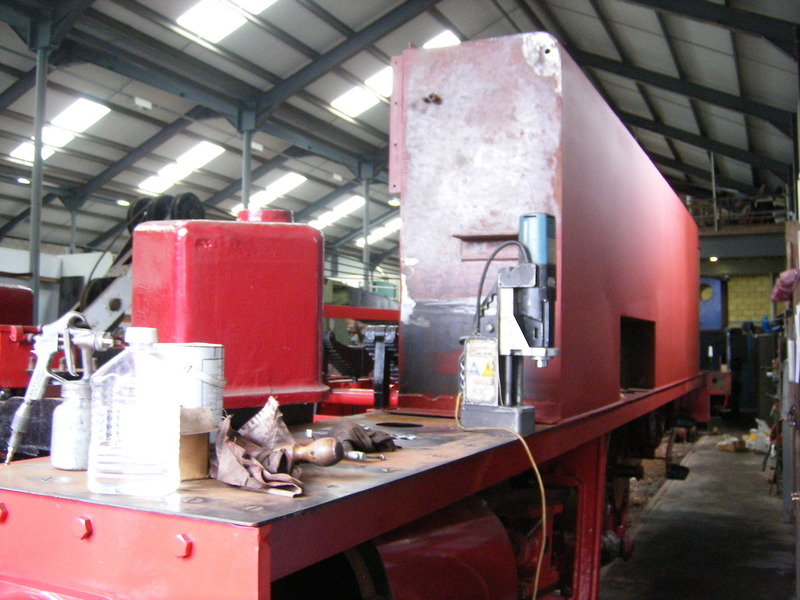 Its boiler was repaired and passed its hydraulic test at West Coast Railway’s Carnforth workshops. Whether or not it will be restored, I don’t know, but I would hope we could manage a coat of paint! S100 was built in 1949 by Hudswell, Clarke & Co.Works No.1822). Worked at NCB Peckfield, Micklefield, Yorks. It was one of 7 17″ Hudswell Clarke locos modified after 1962. It was initially preserved at the Yorkshire Dales Railway, then at Embsay & Bolton Abbey Steam Railway. 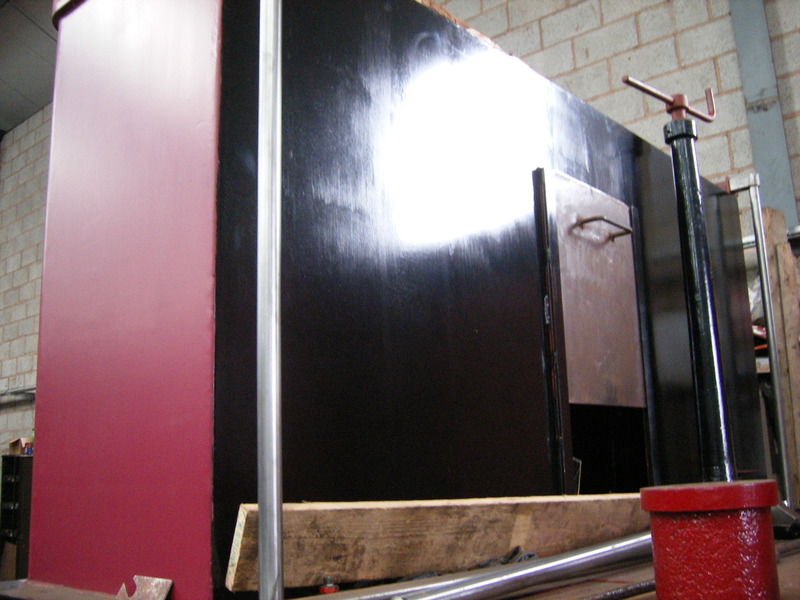 Upon arrival at Chasewater, the 0-6-0 tank was stripped for a full overhaul and is now well on the way to restoration. S100 is the largest steam locomotive at Chasewater. 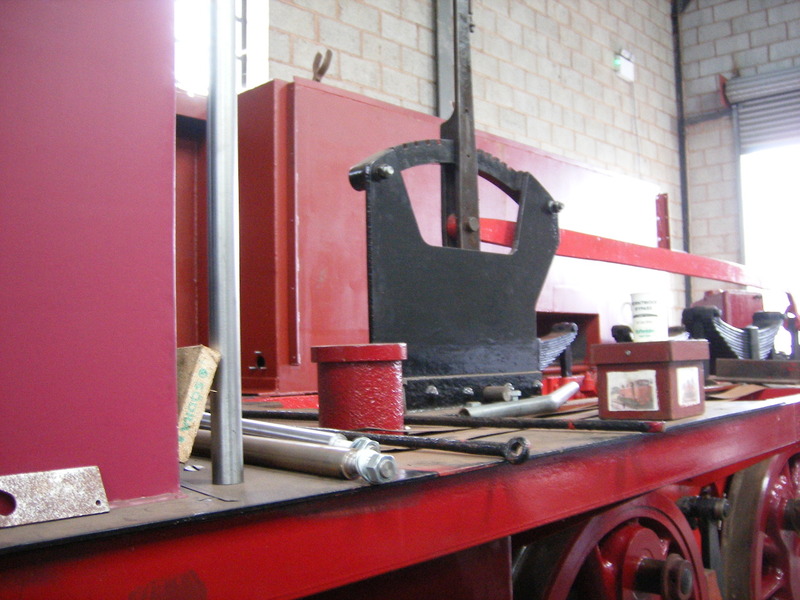 Good progress is being made on this Hudswell, Clarke loco, the coal bunker has been fitted and the connecting rods ready for assembly. The first of the water tanks is nearing completion and before long the second one will be repaired, then they will both be prepared for painting. The goal for this year is to have S100, with tanks in position and a new cab fitted and at least one coat of paint, on display in the Heritage Centre in time for our Christmas visitors. October 11th – a good week-end’s work!